Leicester City restored their eight-point lead over Tottenham Hotspur and took another stride towards the Premier League title with a ruthless demolition of Swansea City. The Foxes were without suspended top-scorer Jamie Vardy and had watched Spurs start to apply pressure at the top of the table. But Claudio Ranieri's side responded emphatically by equalling their best Premier League win and scoring four for the first time since Sunderland were beaten 4-2 on the opening day. Riyad Mahrez took advantage of Ashley Williams' poor clearance to score with a composed finish before Leonardo Ulloa stepped into the space left by Vardy to ensure this was a win achieved in style and comfort. Ulloa headed in Danny Drinkwater's free-kick before the break, then scrambled in the third goal from a loose ball on the hour to give Leicester the advantage their superiority deserved. Substitute Marc Albrighton added a fourth to leave Leicester needing a maximum of five more points to win the title for the first time in their history. They could even clinch it with victory at Manchester United next weekend if Spurs slip up at home to West Bromwich Albion on Monday night. If Tottenham fail to beat West Brom on Monday and Leicester win at Manchester United next Sunday then the Foxes will be champions. What would Leicester City do without Vardy? That question has been asked plenty of times this season - and more so in recent days, after he was suspended for being sent off in the 2-2 draw with West Ham and then hit with a follow-up Football Association charge for his reaction to referee Jon Moss. The emphatic answer came in the shape of Ulloa, who fully repaid manager Ranieri's faith in his ability to replace the man with 22 Premier League goals this season. When Ulloa earned the Foxes a vital point with a stoppage-time penalty last weekend against West Ham, he showed he was not a man to be perturbed by pressure - and he relished the responsibility put on his shoulders against Swansea. The 29-year-old Argentinian striker, an £8m buy from Brighton in July 2014, ran selflessly all afternoon to compensate for the darting, pacy threat of Vardy, and most importantly contributed two goals that eventually made this a stroll for Leicester City. Ulloa reacted decisively to head Drinkwater's inviting free-kick past Lukasz Fabianski on the half-hour, then showed determination to make sure he was first to a loose ball to bundle home his second, Leicester's third, after Jeff Schlupp had broken clear. The two-goal striker was rewarded with a standing ovation when he was substituted late on. Vardy was not missed - and there is no greater compliment to Ulloa's performance. Leicester's King Power Stadium demonstrated its first signs of tension during the draw with West Ham United last Sunday - a result that left the door ajar for title rivals Spurs. Mauricio Pochettino's side took full advantage with a 4-0 thrashing of Stoke City on Monday night, and that could easily have played on Foxes' nerves. Not a bit of it. Well before kick-off, there was a mood of expectation and optimism sweeping around this atmospheric arena, with Leicester closing in on the finale to the greatest Premier League story. Former Leicester forward Alan Birchenall, now master of ceremonies at the stadium on match day, whipped the crowd into a fervour with a rallying speech. The traditional pre-kick-off playing of Post Horn Gallop was accompanied by a deafening greeting for Leicester's players. And once Mahrez gave Leicester the lead, there was never a doubt about the destiny of the points. This ground reverberates on most occasions - but it has surely never been more thunderous than this. The final seconds were played out to roars of "Barcelona, we're coming for you" - the perfect soundtrack to this wonderful, unlikely story of success. This win, however, means that a day of yet greater celebration for the most unlikely of Premier League triumphs moves even closer. Ranieri has spent the season flouting his reputation as 'The Tinkerman' - earned during his days at Chelsea when his penchant for squad rotation sent heads spinning. He has relied on a bedrock of the same 11 players - but he needed to make selection decisions against Swansea, and got them spot on. Once Vardy was suspended, the Italian announced within minutes that Ulloa would be his replacement. He talked up the player's character and ability and got a two-goal performance. He backed another winner when he dropped Albrighton down to the bench and brought in Schlupp. The 23-year-old Ghana international may be an erratic figure but his direct, strong running unsettled Swansea and he set up Ulloa for his second goal. He may be slightly unconventional but he was another to earn a standing ovation when he was substituted. And just to confirm Ranieri had the magic touch, Albrighton emerged from the bench to score the fourth late on. Leicester manager Claudio Ranieri: "It's a fantastic performance. Without Jamie Vardy everyone gave something more. "We knew we had some difficulties but with the fight of everybody we had a good match. "We know it will be tough because Tottenham are a good team but we will fight until the end." Swansea boss Francesco Guidolin: "We began really well, but then we conceded the first goal and we had to change our mentality and the way we played. "We fought for 90 minutes. Claudio is my friend and now I can say it, I hope Leicester go on and win the title because they deserve it. Leicester are a really strong team and they deserve to win the Premier League." BBC Radio 5 live pundit and former Leicester player Robbie Savage: "Leicester winning the league would have to be the best achievement in domestic sport. Ever. It is that incredible. And I don't think we'll see anything like this ever again. "I just can't believe it. Everybody here is the same from when I was around; the kitman, the people holding the doors open. But on the pitch they are transformed. It's one of those moments when you think: I was there." Leicester registered their 22nd victory of the season, their biggest haul of wins ever in a top-flight season (21 in both 1928/29 and 1965/66). Swansea have enjoyed just two victories in their last 13 Premier League away games, drawing three and losing eight. Riyad Mahrez has been involved in a joint-league-high 28 top-flight goals this season (17 goals, 11 assists), level with team-mate Jamie Vardy. Mahrez has netted four goals in his two Premier League games against Swansea this season. Swansea lost by a margin of four or more goals for only the fourth time in their Premier League history (also two 5-0 defeats and one other 4-0 loss). Danny Drinkwater provided his sixth Premier League assist of the season, but his first for anyone other than Jamie Vardy. Leonardo Ulloa has scored three goals in his last two PL games, as many as he'd scored in his previous 25 this season. Only Steed Malbranque (26 in 09/10) has been substituted more often in a single Premier League campaign than Shinji Okazaki this season (23). Leicester travel to Old Trafford to play Manchester United on Sunday, 1 May, while Swansea host Liverpool on the same day. Match ends, Leicester City 4, Swansea City 0. 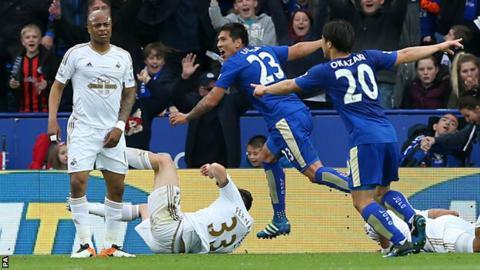 Second Half ends, Leicester City 4, Swansea City 0. Attempt missed. André Ayew (Swansea City) left footed shot from the left side of the box misses to the right. Assisted by Jack Cork. Attempt blocked. Ashley Williams (Swansea City) right footed shot from outside the box is blocked. André Ayew (Swansea City) wins a free kick in the attacking half. Goal! Leicester City 4, Swansea City 0. Marc Albrighton (Leicester City) left footed shot from the centre of the box to the centre of the goal. Attempt saved. Demarai Gray (Leicester City) right footed shot from the right side of the six yard box is saved in the centre of the goal. Assisted by Andy King. Attempt missed. Andy King (Leicester City) header from the left side of the six yard box misses to the right. Assisted by Demarai Gray with a cross. Robert Huth (Leicester City) is shown the yellow card for a bad foul. Attempt missed. Andy King (Leicester City) right footed shot from the left side of the box is close, but misses the top right corner. Attempt saved. Andy King (Leicester City) right footed shot from the left side of the box is saved in the bottom right corner. Assisted by Riyad Mahrez. Attempt missed. Jeffrey Schlupp (Leicester City) left footed shot from the left side of the box is high and wide to the left. Assisted by Christian Fuchs. Substitution, Leicester City. Andy King replaces Leonardo Ulloa because of an injury. Attempt missed. André Ayew (Swansea City) header from the right side of the six yard box is close, but misses to the right. Assisted by Ki Sung-yueng with a cross following a corner. Corner, Swansea City. Conceded by Christian Fuchs. Substitution, Swansea City. Ki Sung-yueng replaces Gylfi Sigurdsson. Jefferson Montero (Swansea City) wins a free kick in the defensive half. Daniel Drinkwater (Leicester City) wins a free kick in the attacking half. Attempt blocked. Daniel Drinkwater (Leicester City) right footed shot from the centre of the box is blocked. Assisted by Riyad Mahrez. Corner, Leicester City. Conceded by Jefferson Montero. Attempt missed. Jeffrey Schlupp (Leicester City) right footed shot from outside the box is close, but misses the top right corner. Attempt missed. Shinji Okazaki (Leicester City) left footed shot from the centre of the box is high and wide to the left.